We now know that the Xiaomi Mi 9 is going to be unveiled one week from today. And while we've already seen the back of the phone from a photo posted on a Weibo page belonging to a company executive, we now have a picture that allegedly shows the front of the device. 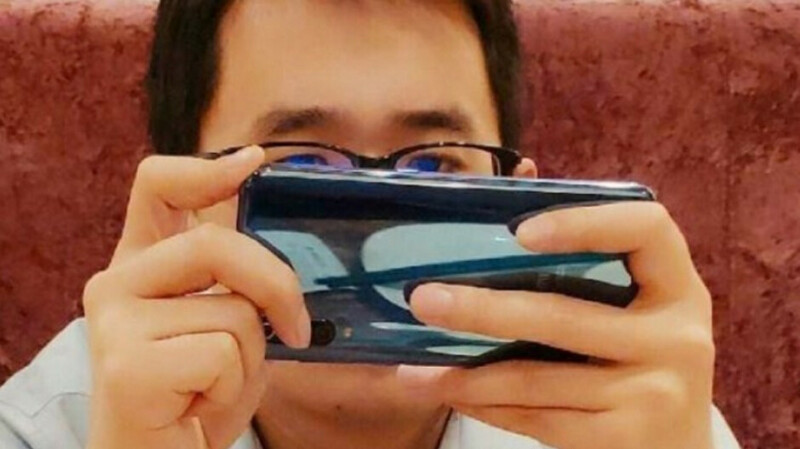 Tipster Ice Universe, who leaked the image of the Xiaomi teaser that contained the February 20th unveiling date for the Mi 9, has obtained a leaked photo of the flagship phone and has disseminated it via a tweet. 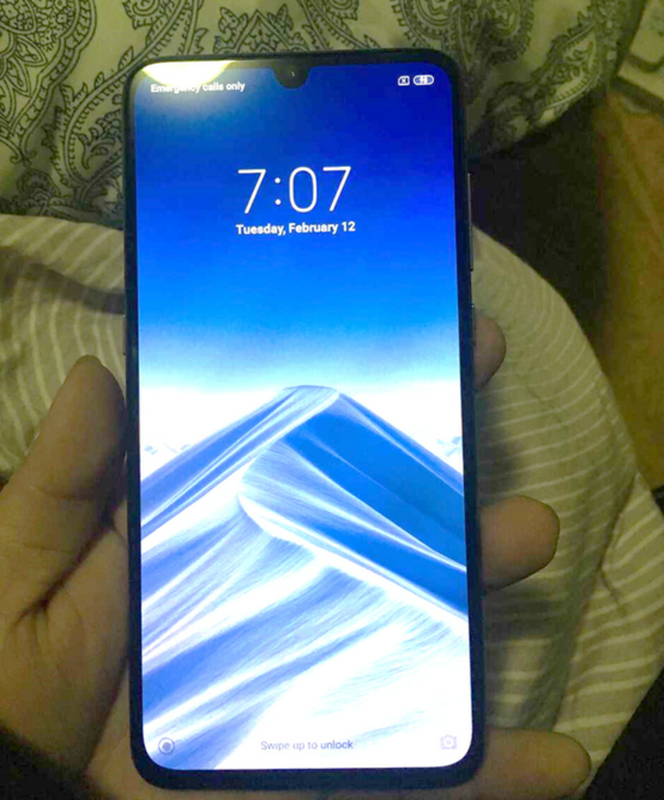 The photo shows a device with thin bezels and a waterdrop notch. Rumored specs have the AMOLED display measuring 6.4-inches, with a 1080 x 2220 resolution (FHD+). That works out to an aspect ratio of 18.5:9. Qualcomm's 2019 top-of-the-line Snapdragon 855 Mobile Platform will be under the hood along with either 6GB of RAM and 128GB of internal storage, or 8GB of RAM with 256GB of native storage. The earlier leaked photo of the Mi 9 revealed a triple camera setup on back. We could see a 48MP primary camera (using Sony's IMX586 sensor), a 12MP secondary snapper, and a 3D Time-of-Flight depth sensor. The selfie camera in front will supposedly feature a 24MP Sony IMX576 sensor. Keeping the lights on will be a 3500mAh capacity battery. Android 9 Pie will be pre-installed along with Xiaomi's MIUI interface. The in-screen fingerprint scanner on the Mi 9 could cover an area of the screen measuring 50mm x 25mm, 5 times the size of the current in-display fingerprint readers found on the Mi 8 Pro and Mi 8 Explorer Edition. The company's co-founder and president Bin Lin has said that Xiaomi will once again release a premium "Explorer Edition" of its new flagship handset. This model could be equipped with 10GB of RAM and 512GB or 1TB of native storage, offer features not found on the regular version of the phone, and come with a transparent back. Xiaomi has recently spun off its Redmi value priced phones as a separate unit. The handsets, offered online only, have done extremely well in India. The country is the second largest smartphone market in the world, but suffers from low per capita income. In an environment like that, Redmi phones do very well. The Mi unit will concentrate on higher end phones available both in stores and online. In its own backyard, Xiaomi has not been doing so well. Data from IDC covering smartphone shipments in China during the fourth quarter of 2018, shows that the company was the fourth largest manufacturer in the country with a 10% market share. From last October through November, Xiaomi shipped 34.9% fewer phones in China compared to the same quarter in 2017. Right above Xiaomi, in third place, was Apple with 11.5% of the Chinese market. Shipments of the iPhone were down 19.9% year-over-year. On top was Huawei with a 29% slice of the pie. The latter's smartphone shipments in the country rose 23% from the previous year. Overall, Counterpoint Research says that globally, Xiaomi was the fourth largest smartphone manufacturer last year and owned an 8% share of the market. The company shipped 121 million smartphones in 2018. Once again, Xiaomi will go on to launch a new flagship phone without making it available to the U.S. market. While the manufacturer has moved into Europe, the environment for Chinese smartphone manufacturers in the U.S. is not favorable at the moment, unless your company is named OnePlus. The U.S.-China trade war coupled with the criminal charges placed on Huawei, and the President's upcoming executive order would make this a risky time for Xiaomi to enter the U.S. market. Trump is expected to ban U.S. carriers from using networking gear from Chinese firms amid fears that the equipment could contain a back door that collects information, and sends it to the Chinese government. Looks sweet. I’m liking the specs a whole lot. Need to see how well it performs. If it performs well enough, Xiamoi just may have my money for this. Quite pleasant design. I hate waterdrops, this semi-circular notch looks much better. This has to be the thinnest chin on android phone, and it looks like it's the same size as the one on the iPhone. Just wish that they made the side and top bezels a tad thicker for a more symmetrical look. This is closer to the XR than the XS, but definitely very thin. oh man....I hate that U notch... put in the V shape!!!! I really never understand who want that extra display in sacrifice with user experience due to notches. I really don't bother with that 18:9 notchless displays. Man i wish there's 8 se successor with the same rectangular shape but with nfc and ufs storage. Now thta's a great looking phone. I'm glad Xiaomi is making the right design decisions. Quite the eye catching design. Nice Xiaomi! In India Xioami is only thriving with their budget lineup. Flagship models are far far way. No one buy their flagship phones. Which is the reason why they didn’t launched any of their flagship phone after Mi Mix 2.